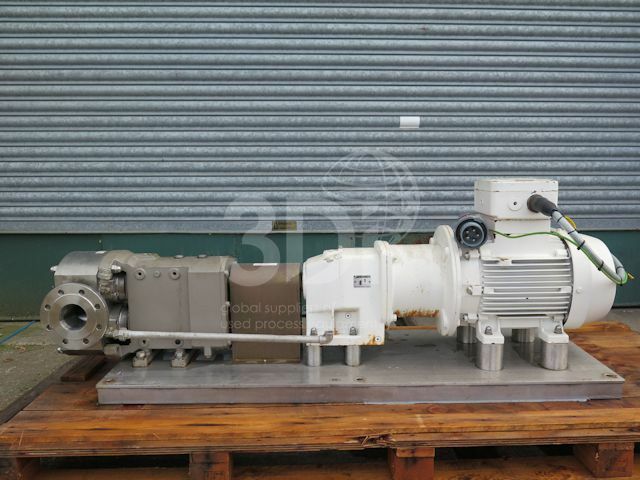 Used Classic+ Rotary Lobe Pump CP40-0180, manufactured by Wright Flow Technologies, 2009. Connections: 76mm/3inch. Material of construction: 316L Stainless Steel contact parts. Atex compliant. Tri-lobe rotor forms. Mechanical seal. Max capacity 75.6m3/hr, displacement 1.800 litres/rev, max pressure 12bar, max temperature 150degC, max speed 700rpm. Fitted with a 11kw WEG electric motor and baseplate.